1. Babylonian amora of the fourth century; a contemporary of Abaye, whose halakot he transmitted, and of whom he was perhaps a pupil (Ber. 46b; Soṭah 32b; et passim), Zebid also transmitted the halakot of Raba and R. Naḥman (B. Ḳ. 84a; B. M. 17a), but he particularly preferred the decisions of Abaye, and it is narrated ('Ab. Zarah 38b) that his adherence to Abaye caused his death. When the people of the exilarch once questioned R. Ḥiyya Parwa'ah regarding a certain halakah, he answered that Hezekiah and Bar Ḳappara had interpreted it, while R. Johanan had decided to the contrary, and that as the authorities thus stood two to one, the law would have to be interpreted according to the majority. Zebid said, however, "Do not listen to him, for Abaye decided according to R. Johanan"; whereupon the people of the exilarch forced Zebid to drink a cup of vinegar, which caused his death. R. Ḥinena b. R. Iḳa is recorded as his opponent in halakic decisions (Me'i. 19a). Zebid particularly explained to his pupils the baraitot of R. Hoshaiah or Oshaya ("bi-debe R. Osha'ya"; 'Ab. Zarah 6b, 56a; B. M. 92b; et passim). 2. Contemporary of the preceding, and generally called Zebid of Nehardea (Ḳid. 72b; comp. Rashi ad loc.). He was for eight years head of the yeshibah of Pumbedita; and among his pupils were Amemar, Huna b. Nathan, and R. Kahana (Ḳid. l.c. ; B. M. 73b; Yeb. 18b; and elsewhere). At his death R. Kahana delivered his funeral oration at Pum Nahara (M. Ḳ. 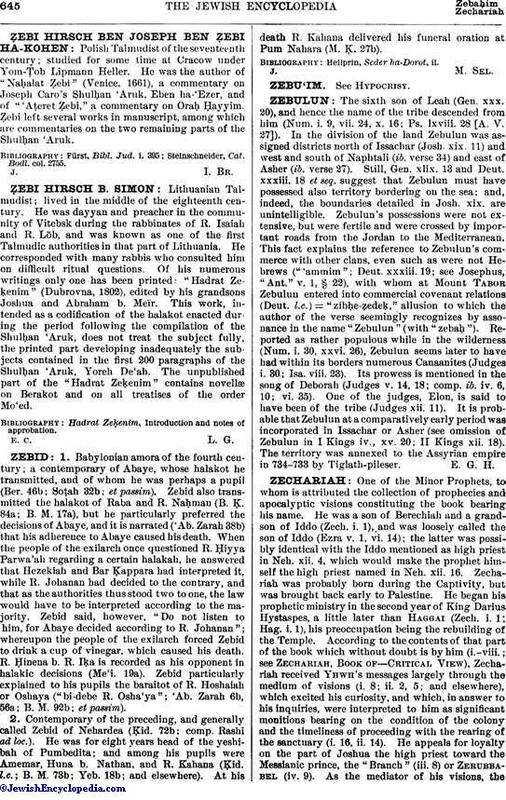 27b).Bibliography: Heilprin, Seder ha-Dorot, ii.J. M. Sel.